Always wanted to experience the country side? Wanted to escape into the sets of Dilwale Dulhania Le Jayenge, with the wind gushing into your hair amongst the yellow pop of mustard crops? Punjabiyat is the place to be then! Punjabiyat resort in Amritsar is located in a village called Gurdaspur, 75 km from Amritsar. Roughly an 1.5 hr drive from Amritsar. 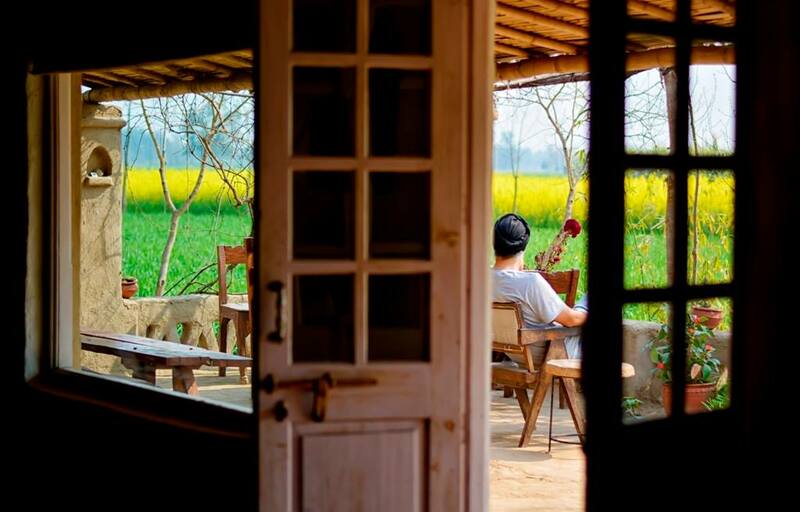 At Punjabiyat resorts near Amritsar, we have four beautiful standalone cottages set amidst 10 acres of farm land. One can have a 360 degree view of the farmlands at Punjabiyat resorts near Amritsar, a priceless luxury for the modern day traveller. In addition to the 4 cottages this resort near Amritsar boasts a spacious lounge which has been designed in traditional Punjabi architecture to give the traveller a rural feel. The experience at this resort gets upgraded to another level by the plunge pool where the guests can cool off with a beverage or just dip their feet. Each cottage at this resort also has a private terrace where arrangements can be made for a candlelit dinner or even if one wishes to sleep under the stars, arrangements can be made for the same to enhance the experience for the guests. The serene surroundings of this resort gives an opportunity for the traveller for various activities that can help the reconnect with their roots, such as tractor rides, bullock cart rides. Ask yourself, when was the last time did you do these things? One can even try their hand at farming, in the sowing and harvest season of course! Click here to call us at 9818705508, to book now. This beautiful resort near Amritsar features 4 standalone cottages and lounge. The cottages each have a private terrace and lovely patio to gaze idly at the farmland. It is ensconced by criss crossing water canals that are used for irrigating the fields. The concept of this resort near amristar is to give the traveller a taste of the serene rural life which the city brats are deprived of. Once can notice that Punjabiyat merges with the surrounding landscape. 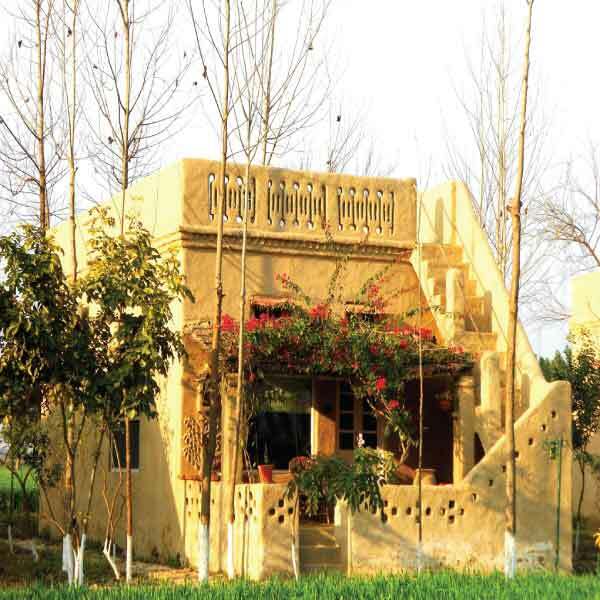 The cottages at this Amritsar resort have been inspired by the rural architecture of Punjab. So what is interesting about this style of architecture is that it is built by mud blocks scooped from the site nearby and a coating of mud is plastered on all the walls of the cottages. This mud plastering technique acts as a coolant almost like an air conditioner in the summer, keeping the rooms cool and sets an calming environment in the resort and similarly acts as an insulation – in the cold winter months keep the guests of the resort warm and cozy. In addition to the four cottages, there is a lounge at this resort in amritsar that has been decorated in traditional style with pickle jar in the stellar and a plough hanging from the wall like any typical farm house in Punjab. What is all the more exciting is the Machan (Rooftop ) room where there is a cozy library at the bottom alongside a plunge pool. Atop is the rooftop where meals can be served as per the choice of the guest. The speciality is that one gets to eat breakfast overlooking the morning dew that has been sprayed over acres and acres of fields – A sight to behold and luxury that no other resort in Amritsar can provide you. Punjabi cuisine needs no introduction. All over the world, Punjabi food is directly associated with Indian Food. Owing to the prosperity of this region, the food of this region is worthy of being served at any royal feast. Punjabiyat resorts in Amritsar is no exception to this. The cuisine of Punjab offers mouthwatering options to both vegetarians and non vegetarians as well. As you enter this resort in Amritsar you will be welcomed with a tall glass of Lassi/Sugarcane juice which are the traditional drinks of Punjab.This resort in Amritsar situated amidst mustard farms serves the winter staples such as makki di roti (bread made from maize) and sarsoon ka saag (mustard leaves) garden fresh, you can see our chef literally pluck the mustard leaves of the fields for preparing the dish. Since food is a very important aspect of Punjabi culture we at Punjabiyat also try to achieve this. A diner at this resort near Amritsar can get the luxury of sampling wide variety of options. All meals are a good sumptuous 4 course affair. We also serve continental options as having two Punjabi meals in a day can be very heavy. The best feature of Punjabiyat is that we don’t restrict our guests to have their meals in the lounge/dining area. 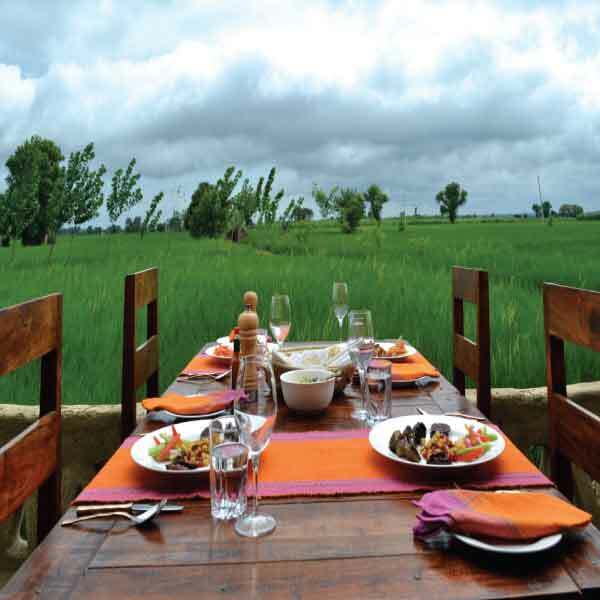 One may choose to eat their breakfast overlooking the fields in our lovely machan. Lunch can be had on charpoy in the authentic Punjabi style under the shade of a tree or on a clearing amidst the fields. For dinner, the guests can enjoy an open air barbeque with their friends and family on the terrace to enjoy the succulent kebabas. A luxury that the modern day hotel doesn’t offer a traveller. And this is why we at Punjabiyat believe that this resort in Amritsar is not just any hotel but a destination on itself. After visiting the nearby village on a tractor or after a fiesta or a stroll say even a dip in the plunge pool. We serve a high tea with Punjabi snacks such as Matthi, Shakkar pare and homemade biscuits which are a must try for all. We at Punjabiyat try to do justice to the extravagant Punjabi food culture in all ways possible. Trips like the ones you make to Punjabiyat will leave you with something to say about exploring your own backyard before considering a trip to London, Bangkok or Bali. As city brats we almost know nothing about the lives that our ancestors lived 50 / 60 years ago. With the absence of technology and wifi to entertain, one can never be sure as to how they spent their time. At Punjabiyat, there is a lot to do and equally there are lot of reasons to do nothing. You can chose to unwind and reconnect with your roots or just have a laid back holiday sipping tea / hot chocolate in the verandah of the cottage and gaze at the starlit sky. Tonga / Bullock cart ride: Visit to the local village and a dairy farm on a traditional horse / ox driven cart ride. Tractor ride: Visit to the local Sikh temple and the Sikh history museum nearby on a tractor and the Guests can also try their hand at driving a tractor. Visit local Sikh Temple: There is a famous Sikh temple (Gurudwara) called Ghallughara, 20 minutes walk or a beautiful ride on the Tractor from the lodge to listen to mesmerizing Gurubani recitals (Sikh religious songs) is an amazing experience. During weekends a mobile market is set up outside the Gurudwara where local souvenirs can be bought. Sikh history museum: Guests will get an opportunity to know about the glorious history of the Sikhs and the Punjab province. The museum is one of the three being built by the government to encourage youngsters to take pride in their culture and history. 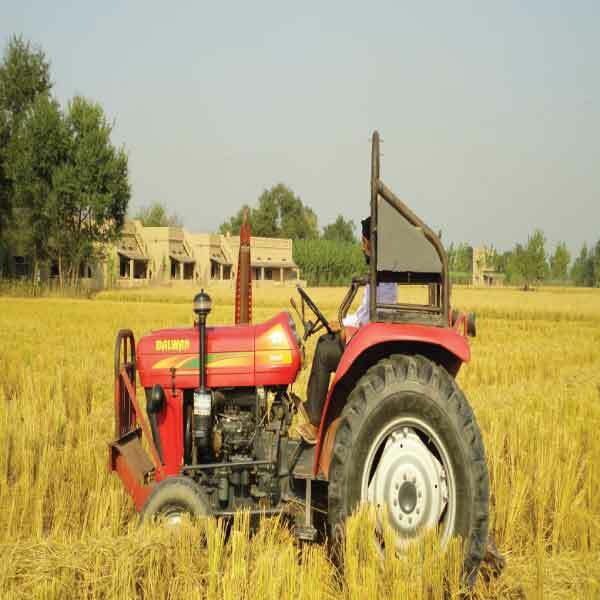 Participate in farming: Participate in farm activities (depending on the season/month of travel and subject to farm activities) – Be an apprentice to the farmers in their fields, get an understanding of the local crops and their cultivation and visit a local vegetable and grain market aka Mandi (in hindi). Click here to call us at 9818705508, to book now. 9 hours from Delhi (approx. 450 kms). Drive on NH1 which connects Delhi – Ludhiana – Ambala. Before reaching Jalandha, turn right to Phantankot (NHA1) around the bypass. From there it is another 75 km drive to Mukerian. On reaching Mukerian turn right to Gurdaspur (SH 25). Cross the bridge over the beas river and driver for another good 3 kms and one will reach Purana Shalla a small village square. From there take a left and drive another 3 kms to Saidowal – Gunopur village. It is near the Gurudwara Gallughara Sahib. Roughly an hour’s drive from Amritsar (75 kms). From Amritsar drive for about 70 kms to Gurdaspur (NH 15). Once you reach look for a vintage fighter plane on the left side of the NH (spot is called Jahaz Chawk). Ask for Tibri Cantt road (SH 25) and drive on for about 6 kms, cross a canal bridge to reach Tibri Cantt. From Tibiri Cantt drive for another 2 kms to reach another small canal bridge and look for a Punjab Tourism sign board. Take left and follow the road along the canal for about 3 kms to reach Gurudwara Ghalughara Sahib. Punjabiyat is an easy reach from key Punjab and Himachal destinations – Amritsar (75 km), Pathankot (45 km), Chandigarh (220 km), Dharamshala (90 km), Ludhiana (160 km), Jalandhar (100 km). You may break your journey to Himachal destinations at Punjabiyat. Punjabiyat is well connected by the Indian railways network. The nearest station is called Mukerian and is just a 25 min drive from Punjabiyat. Other include Amristar which is a 1.5 hr drive Punjabiyat and Phatankhot a good 1 hr drive from Punjabiyat. There is a Shatabdi from Delhi that goes to the river Beas (1 hour from Punjabiyat). Airport in Amritsar is well connected with national and international flights. Punjabiyat is just roughly one hours’ drive from Amritsar Airport. From Delhi there is an Air India flight to Pathankhot 4 times a week. Phatankhot is also just an hrs drive to Punjabiyat. Additional cost will be charged for pick-up and drop for to and fro to the railway stations and the airport.